Akiya Henry in The Dark at the Ustinov, Bath. Photo: Helen Murray. The Dark tells a story that writer Nick Makoha is well versed in. Not only is it his own story, an autobiographical retelling of his and his mother’s journey out of Uganda in the 1970s, but he has written about similar themes in his award winning poetry collection Kingdom of Gravity. In the programme notes, Makoha says that while the collection takes a wider view, the play is about his own personal experience. But while the play is filled with individual details, this description underplays its impressive scope. Using a mosaic of experiences of those journeying on the bus with him, Makoha creates an impression of a time and place. While this can occasionally feel like almost too much, threads of narrative that initially feel tangled and disconnected ultimately come together to create an impressive tapestry. 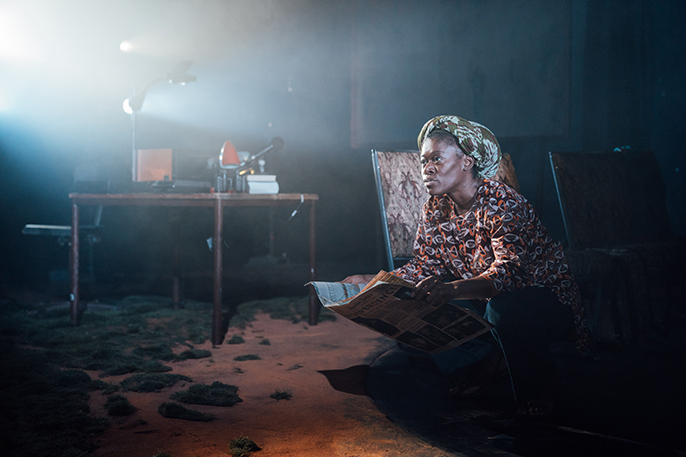 What really makes this work is the incredible transformations that actors Michael Balogun and Akiya Henry undergo – as they switch and swap characters each feels clearly defined and recognisable. This gives not just clarity but delight – the audience can quickly settle back into running jokes or previously built emotional connection with characters which, while exaggerated enough to be distinct, never feel like they slip too far into caricature. The Dark feels deeply satisfying for the way its title is woven throughout, both explicitly and implicitly. The characters talk about the dark we all come from, the dark of a night in the forest. Characters hide in the dark, or try to find their way through it. Their fates disappear into the darkness as Makoha’s interaction with them ends. And throughout, the play makes me think about how, quite literally, so often stories come from the darkness; the dark of the theatre lights going down, the dark of our eyelids as Balogun asks us to close our eyes and listen, the dark of the silhouettes projected on the overhead projector, the dark of the words on the pages of a poetry collection. I don’t know exactly who designed them (potentially a split between designer Rajha Shakiry and lighting designer Neill Brinkworth) but the projections are absolute beauties. They are delightful in their layeredness – cast onto a faded sign, there’s never a blank slate to begin with, adding to the feeling of the story being told by building up numerous characters and stories. And then the silhouettes and writing of the overhead projector are combined with a slide machine (complete with satisfying clunk), to layer even more texture and meaning onto the battered, old sign. This is characteristic of the ingenious set and lighting design throughout. A conveniently placed radio and dim lighting turn under a table into a secret transmitting station. The ‘top of the bus’, a wire grid packed tight with luggage, sways and shifts its angle to show different locations. The Dark is a fascinating story, well told. It focuses on individuals and how they are affected by their circumstances, rather than the circumstances themselves. The mosaic structure means that I was sometimes left wanting more before the story jumped somewhere else, but overall it’s deeply satisfying to watch. The Dark was on at the Ustinov, Bath from 18-19 January. It tours to Chichester, Poole, Edinburgh and Glasgow until 19 February. More info here.